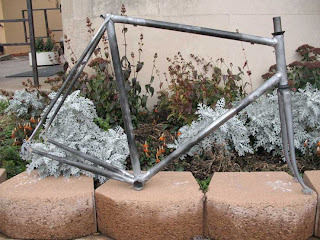 This frame is built with NOS Reynolds 531 tubes along with stamped and welded long point Prugnat lugs. The lugs take a lot of work to make them presentable. I reshaped and filed them to a new profile. 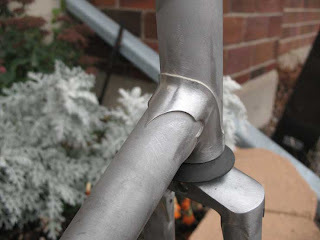 These old lugs present many challenges but in the end they can look really great. 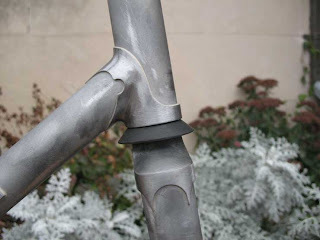 A subtle thing is the larger radius at the crotch of joint which you can see in the picture of the lower head lug. It’s just an aesthetic thing but looks matter. 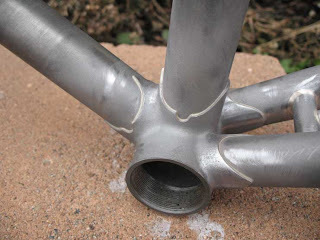 I think all frame builders working with lugs should build at least a couple of frames with the old welded and stamped lugs. If for no other reason but to get some filing in. 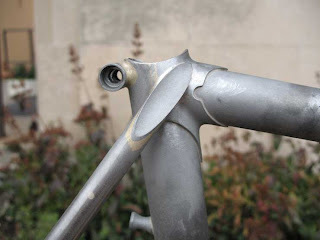 I see too many frames these days being built without the benefit of the business end of a file. 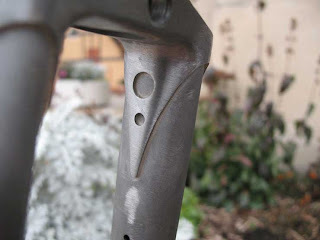 The frame is designed around standard reach brakes and will have a front rack. I took these photos before putting on the rack mounts on the fork blades.